The Pope was in Germany last week and several news organization reported on how he spoke out against gay marriage. 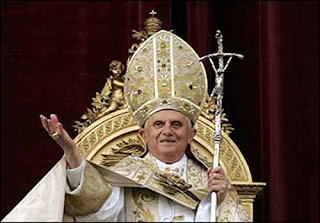 (Read this article) Shocking-- the Pope is unwilling to update his church's thinking?! However, I'm always surprised (I don't know why) when church leaders are against gay people. How is my marriage going to impact the Pope's church? I'm not Catholic. Why does it matter to him? I don't get it. Just like he, clearly, doesn't get me.